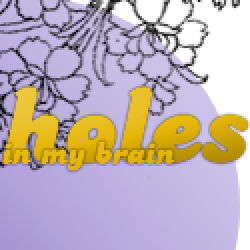 full review can be found on my blog, holes In My brainSince I finished the book, I have been pondering with exactly what I wanted to say. I had a few metaphors floating around in my head, but I think this one describes it best: Please Ignore Vera Dietz is like a boyfriend. Okay... let me explain. There is so much to love about this boyfriend. It's alike a whirlwind romance, but then this boyfriend goes out and does something and you just want to tear your hair out and sob for days, but there’s still that unconditional love for him. That's my feelings about this book in a nutshell.There is no doubt that this book is great. It has a (as it is quite a popular term) “spunky” protagonist, Vera, who has a mountain of issues and is driving full throttle through it. I loved her character and more specifically, the amazing relationships she had with others, whether it was the broken one with Charlie or the weird one with her father (oh hey Ken Dietz, you kind of rock). I thought all aspects of her various connections with other characters were extremely well developed and definitely helped me commit emotionally to her story.I bet you’re wondering what I’m talking about with the ‘tear your hair out and sob for days’, right? Well.. it’s Charlie, the dead kid. I had a funny relationship with this book because he’s such an important piece to the story but it was like he was toying with my heartstrings. We’re basically in the honeymoon phase when Vera narrates the various flashbacks, but then I learn he’s done crappy things to hurt Vera (tear my hair out). When I found out the truth about him and how he died... well (sob for days).Even though it’s ‘just a book’, I felt like shaking a fist and screaming “WHYYYYY, he’s got so much life ahead of him, why?? *sniff*” Then I went to anger: "God Charlie, why were you so stupid?!" So take this as a good sign because I was whipped, so to teen-speak.The writing style and narration quickly sucked me into the story and as I was plunked down right in the middle of Vera’s disarrayed life, I was fascinated. I mean, she’s a pizza delivery technician (driver) with some pretty ohemgee horror stories (seriously). And she’s a smart girl. I like smart people in books.4.5/5 – oh, because I really loved it but there were just those little argh-inducing-Charlie-moments that made me sad and left me conflicted. Vera Dietz has climbed up my list of favourite female characters of 2011, and I thought she made mistakes and searched for redemption, along with trying to figure out her true path in life. I found myself relating to her (surprisingly) because I feel the insecurities and emotions were incredibly well done. The writing is impeccable (not really surprised, seeing it’s a Printz) and also, there are slightly-switchy POVs* which I loved (oh hey there, Pagoda, am I littering?). 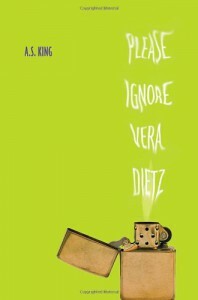 Please Ignore Vera Dietz is what I wish more contemporary YA novels are: emotionally honest, well written, and contains characters who deserve to tell their stories.